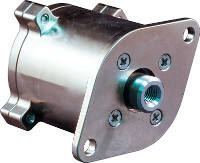 Glenair space mechanisms are optimized for foolproof release reliability with built-in mechanical and electrical redundancy. The planned release of the deployable satellite/payload is activated by a pre-determined value of electrical current to a fuse-wire system which causes the wire to break under tension and allows a pre-loaded mechanical bolt to actuate. Glenair's line of low-shock, redundant and nonredundant space mechanims includes both HDRM devices as well as a family of pin pushers and pin pullers. Customer-defined housing and mounting configurations are available. Consult factory for specific device TR level and qualification test reports.